What Capabilities Are You Missing Out On? 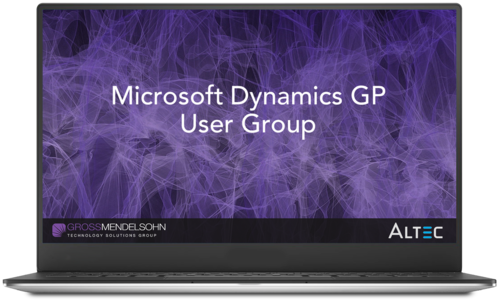 Whether you've been using Microsoft Dynamics GP for 10 days or 10 years, there's always a new trick you can learn. Watch this free user group recording to start leveraging the full power of your ERP system. Michael is a Certified Public Accountant and Microsoft Certified Technology Specialist. Anyone who has ever worked with Michael knows that he’s passionate about getting the most out of any software package. He works his magic with Microsoft Dynamics GP daily, helping clients increase efficiency, run meaningful reports and streamline business processes. Sharon Paul, CPA, MCTS, is the leader of Gross Mendelsohn's Technology Solutions Group. Helping clients discover how to use technology to solve tough business issues is what drives her. Hearing clients say, "Wow, I never knew I could do that!" is music to Sharon's ears. Laura Lechien comes from Altec, Inc. with expertise in sales, consulting services, project management, and training. Laura has served as the subject matter expert at many events and is adept at equipping organizations with state-of-the-art tools and knowledge to successfully streamline business processes, drive down costs, and go green.